We can install new LED lights in your Tampa, FL home or business in an efficient and affordable manner. The lights your home or business uses play a large role in how much energy your location consumes. If you’re looking for ways to cut back on your energy bills, LED lights may be a good solution. • Heat – LED lights only emit a small amount of heat. Comparatively, other types of lighting, such as incandescent lights, release a large majority of their energy as heat. • Direction – Since LED lights only release heat in a very specific direction, there is no need for diffusors or reflectors that can trap light. For this reason, LED lighting is a much more efficient option for down lighting and recessed lights. • Light Source – LEDs are extremely small, and a combination of green, blue, and red LED lights is usually used to make white light. One of the main benefits of LED lights is that they can be used in a variety of applications. For example, if you own a business in the Tampa, Florida area, LED lighting can be used to light your parking garage, illuminate your hallways, or provide task lighting that you use in your workspace. 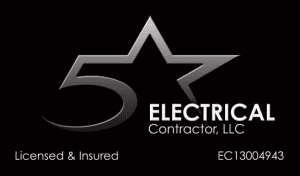 At 5 Star Electrical LLC, we can install new LED lights in your home or business in an efficient and affordable manner. If you have any questions about this type of lighting or why it is beneficial, please don’t hesitate to reach out to us.